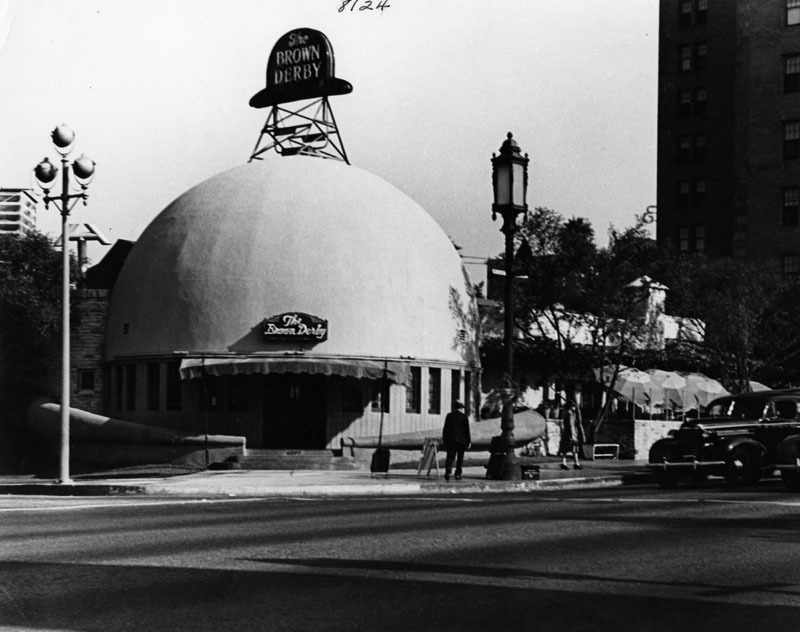 Back in 1926, at 3427 Wilshire Boulevard, a giant brown hat opened as a restaurant. Called the Brown Derby and shaped to look like the type of hat it was named after, the restaurant is legendary as an example of Programmatic Architecture and was designed to draw in motorists, although it also became popular with patrons of the Cocoanut Grove nightclub at the Ambassador Hotel across the street. The building was thirty feet in diameter and seventeen and a half feet tall. It was so successful that it spawned three additional restaurants in the Los Angeles area, all of which are now closed, as well as a chain of Brown Derby restaurants in Ohio, of which there are still five operating. By 1937 the giant derby relocated to 3377 Wilshire Boulevard. Sadly, although it's run lasted several decades in 1975 it was sold, renovated, and eventually it closed on September 9th, 1980. Soon after it was replaced by a shopping center fittingly called the Brown Derby Plaza. The hat was moved up to the third floor of the plaza and at one time hosted a Korean restaurant / bar, but is now at least as of 2016, vacant. As mentioned, the Brown Derby led to three additional Los Angeles area restaurants including the Hollywood Brown Derby, the Beverly Hills Brown Derby, and the Los Feliz Brown Derby. None of them were in the shape of a giant hat, but still were very popular restaurants on their own. The Hollywood location opened on Valentine's Day in 1929 and was a hot spot for many of the Hollywood famous and elite. Clark Gable, for example, is suppose to have proposed to Carole Lombard there. At the time the restaurants were owned by Robert Cobb who, while operating the Hollywood Brown Derby, invented the Cobb Salad. The restaurant with hundreds of celebrity drawings and caricatures lining its walls lasted until 1987 when a fire sadly swept through the building. The Beverly Hills location, located at 9537 Wilshire Boulevard was opened in 1931 and lasted until the early 1980s. The Loz Feliz Brown Derby opened in 1940, but was purchased in 1960 and renamed. However, in 1992 it sorta returned to its roots, by becoming a nightclub called The Derby. The nightclub closed in 2009, but not before being at the center of a swing band resurgence hosting various bands such as Big Bad Voodoo Daddy and Cherry Poppin' Daddies, which even sang a song entitled "Brown Derby Jump". The Hollywood Brown Derby lives on, most notably by being recreated at various Disney parks including Disneyland, Disney World, Disneyland Paris, and Tokyo Disney!